The screening programme No Middle, No End is a deep journey through a crisis of identity, which no longer adheres to imposed generic standards, drifting into a sense of helplessness caused by physical and mental inertia, panic of failing, and euphoria: something between what Lovink calls the “psychopathology of information overload” and a mystic upper level of awareness. Showcasing video works by artists from different backgrounds, generations, and practices, the programme curated by Federica Patti represents an opportunity to see how the relationship between living beings and the technological dimension enables us to consider hitherto unprecedented meanings. The films by Andrea Familari, Baden Pailthorpe, Boris Labbè, Diego Zuelli, Emilio Vavarella, Glenn Marshall, Marco Mendeni, Mattia Casalegno and Nicolás Rupcich are characterized by different narrative techniques – from found footage to real-time processing – hyperbolic deviations and speculative projections. The boundaries between what’s virtual and what’s real are mixed-up, the spectator is a secondary element and the authorship of the work is blurred. Animal Cinema, the latest film by Emilio Vavarella, is composed of fragments of videos of animals operating cameras. The work starts this journey as a statement that opens us to post- and non-human aesthetic scenarios. In turn, the main protagonist of Nicolás Rupcich’s EDF – Error de formato are the Chilean Patagonian landscapes from the Torres del Paine National Park. As the video develops, the images are slowly being deleted, making us aware of the instability of the representational surface and the problem of digital representation in the context of the “post-photography era”, where the images are no longer a representation of reality, but a way of reality itself. Inspired by the Italian neoclassical sculptor Antonio Canova, Knowledge of the Body is an audio-visual artwork by Mattia Casalegno that deals with the idea of beauty and the fallacy of the presumed superiority of man and machine over nature. Using photogrammetry, a technique employed in archaeology, parts of Canova’s statues on display at the Civic Museum in the North Italian town of Bassano del Grappa have been digitally scanned and further elaborated. Modified using CGI animation, the work presents glossy futuristic car details intermingled with body parts of the statues in order to crash and explore the relationship between body aesthetics and contemporaneity. The use of a platform for the creation of virtual worlds has allowed Marco Mendeni to develop a parallel reality: he deconstructs and disintegrates the matter, aiming to achieve a gradual change of the environment. r_lightTweakSunlight gives rise to an environmental path entirely realized with Cryengine3 engine, populating it freely with textures and extravagant physics laws, in a search which is about space and shape, thanks to computer use. “There is no beginning, no middle, no end, no suspense, no moral, no causes, no effects” is a quotation from Kurt Vonnegut’s Slaughterhouse Five chosen by Diego Zuelli for his video work, and by the curator as the title of the programme. No Middle, No End presents a set of digital processes, works in which the generating force of transmutation by generative codes undermines the common conception of (creative) consciousness, and goes beyond the anthropocentric perspective. Untitled by Andrea Familari tries to re-describe the magic of creation through a metaphor: the birth of a seed, a journey through its life, its attractive blooming and transformation into flower. Metamorphoses and being reborn as a seed, again and again, are literally re-enacted by numbers and algorithms. Processed by a generative code, Untitled represents an artificial way of blooming, a never-ending loop that creates and reshuffles linear forms and holy colours, spheres mutating in a hypnotic vortex made by petals that magnetize and show all their stories and the world. Our World. Glenn Marshall has made Radiohead – Codex using the three separate animations he has done based on code-generated particle animation: Particle Man + Star Girl + Universe Hand. Inspired by science and nature, the meditative and the abstract, and with a philosophical narrative, this animation is created through generative code art and innovative software tools. A seductive, psychedelic visual loop of cadence, kaleidoscopic camouflage and mimicry in Baden Pailthorpe’s playful works Cadence Series transforms the gestures of virtual soldiers into a hypnotic dance scenario, negotiating the relationship between warfare and the performative traditions and rituals of military institutions. Meaning “long series or plethora” in French, a result of the capture of real objects translated to video abstraction, Boris Labbé’s Kyrielle was built with 285 watercolours that gradually deform through improvised movements. Like Cadence, its repeating rhythms and cycles also have a hypnotic quality and encourage the viewer’s eye to wonder playfully and explore different figures. The animated ones are developing in a process of symmetry and abstraction, and then returning to the minimalist aesthetic of the initial white. The final piece, following a palindromic form, was then digitally designed. All these videos are marked with the concept of palingenesis, appealing both to the loop and regeneration: a cyclical return of the same events, a regular reappearance of ancestral characters, a perpetual return to life. Again and again. No middle, no end. Thanks to: Adiacenze, Gallleriapiù, Sullivan+Strumpf gallery and the artists. “DE ORACULIS NOVIS”, the new solo exposition by Marco Mendeni will be held in Area35 Art Gallery curated by Arianna Grava . Researching on the basis of the rappresentation of aesthetic values of the new medias , Mendeni invites us to consider the deep consequences of modern technology. With De Oraculis Novis the artist creates a multilayered project with multiple levels of perception, defining the human context, albeit the simulated one, through the movie-like video screen , the ultimate immersion in the virtual reality and finally using the oil painting technique. It is therefore the presence of these great paintings with lines, colors and lights taken from the generated virtual landscapes that testify the undergoing overlapping of reality and simulation both in the landscape of man and within man himself. 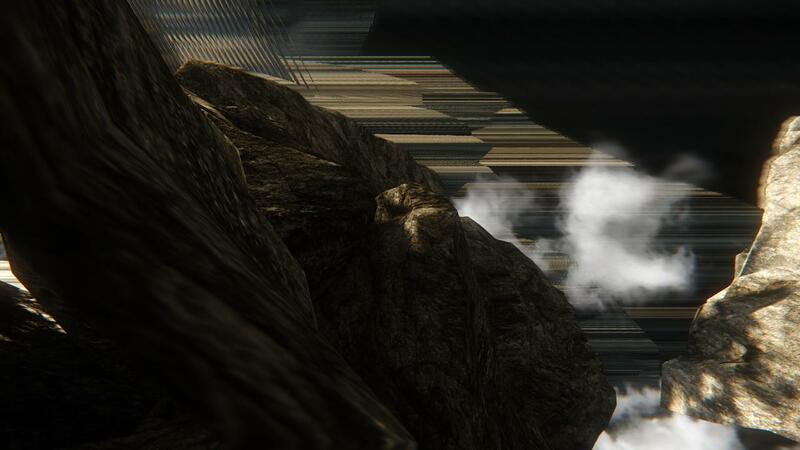 The project stems from Mendeni’s short video “r_lightTweakSunlight” originated from the hectic behavior of a game software riddled with bugs that gave birth to suggestive landscapes and the subsequent explorative documentation of the computer generated world. Within the exposition a dark room will be present where the full experience of the virtually generated world will be given to the audience with a full VR visor. Invece di interrogarsi sul futuro, Marco Mendeni si domanda chi lo desidera e perché. Algoritmi e cibernetica, dispositivi e apparati, videogiochi e simulazioni sono il materiale grezzo di cui si serve per creare nuovi codici. Il risultato è una approccio squisitamente computazionale al mondo. Tuttavia, nella sua pratica eclettica e insieme straordinariamente coesa, si scorge una certa nostalgia (disincanto?) per il futuro, un desiderio inappagato per un’utopia irrealizzata. In un’epoca di scetticismo diffuso per le mille promesse non mantenute dalla Silicon Valley, Mendeni ci invita a riflettere sulle conseguenze profonde della tecnologia. L’etimologia di hype risale agli anni Venti. Indica la retorica iperbolica, esagerata, roboante dell’allora nascente immaginario pubblicitario. In altre parole, hype è un’elaborata menzogna. Il termine si diffonde a partire dagli anni Cinquanta, in piena Guerra Fredda, fino a raggiungere l’apoteosi nei Novanta, quando diventa una presenza fissa nei reportage giornalistici sull’elettronica di consumo. L’hype feticizza il new dei new media, ma è anche l’implicita ammissione che l’obsolescenza pianificata è la modalità di produzione standard del tardo capitalismo. Mendeni non fa marketing, né cade nella trappola del determinismo tecnologico. Semmai, esplora i meandri e gli anfratti dell’high tech come un archeologo del futuro. Mette a confronto differenti versioni dell’avvenire, rigettando la semplice causalità per privilegiare le correlazioni bizzarre, le situazioni inaspettate, gli scenari imprevisti. Nelle sue opere, grafene e cemento, movimento e stasi, pesantezza e leggerezza s’informano reciprocamente. L’hype è un sogno, l’hype è un incubo. L’hype è uno stato di eccitazione isterica, ma anche di profonda ansia. L’hype è una prefigurazione, l’hype è una gratificazione posticipata. L’hype non è hope. L’hype è adesso. L’economia nell’attesa«L’attesa del piacere è essa stessa piacere» diceva il filosofo Lessing e, più recentemente, una nota pubblicità. Lo sanno bene i videogiocatori, che a partire dai primi criptici annunci di un gioco particolarmente atteso sono vittime di una serie di reazioni chimico/fisiche, probabilmente localizzate nel cervello ma ancora non ben studiate, che rientrano sotto il nome di hype. L’hype, – da hyperbole, iperbole – è come una bestia parassitaria che ha una fame insaziabile di immagini, dichiarazioni, anteprime, rumor, trailer e date d’uscita: ognuno di questi elementi (promotori dell’impossibile)non fa che accrescere l’hype stesso ed il suo controllo sulla personalità del gamer, il quale letteralmente si gonfierebbe ed esploderebbe come un palloncino se non arrivasse il fatidico day one a portare il gioco. Il quale, nella più classica interpretazione de Il sabato del villaggio leopardiano, spesso porta una soddisfazione non commisurata all’hype stesso, che si traduce in critiche pedanti al titolo stesso e nella ricerca di un nuovo oggetto del desiderio.Alcuni studi hanno dimostrato che l’attesa di questa data fatidica determina nella mente del videogiocatore un vero e proprio sistema di riferimento temporale alternativo a quello ufficiale: il tempo è misurato non in ore e minuti, ma in distanza relativa dal day one. Partiamo da una considerazione scontata: il videogiocatore di oggi è una persona estremamente esigente. Non si sa esattamente cosa un giocatore cerchi di volta in volta in una nuova uscita; l’oggetto del desiderio cambia spesso, ma qualsiasi cosa sia la pretende, punto. Ad ogni nuova generazione l’occhio critico del giocatore punta su caratteristiche forse prima trascurabili, ora assolutamente necessarie. Si parte magari da una trama intrigante, passando per un maggiore livello grafico e terminando, in tempi più recenti, alla fluidità e alla stabilità, soprattutto in termini di risoluzione e framerate. Anche la minima variazione o delusione delle aspettative comporta una campagna mediatica diffamatoria nei confronti delle software house responsabili ed un’inevitabile influenza sulle valutazioni del gioco stesso. Ciò che di più ha portato il videogiocatore contemporaneo ad assumere livelli critici tanto granitici, tuttavia, ha un nome: hype. Attesa. Un’Attesa che si protrae ed Eccitazione…….. Hype. Ma, come sempre, grandi aspettative generano grandi delusione che si rivelano in un appuntamento mancante. Nel senso etimologico del termine: ha creato un sentimento di sorpresa. Mi spiego meglio: entrando in galleria non si vedono video, computer, dispositivi elettronici. Niente di tutto ciò. Eppure la presenza delle nuove tecnologie è tangibile. Ecco la prima sorpresa: Mendeni riesce a parlare della «macchina tecnologica» con elementi antichi: tavole ad olio e lastre di marmo.I suoi dipinti sono attrattivi; mi avvicino perché devo riuscire a capire di cosa sono fatti, li voglio toccare con il mio sguardo e loro si fanno avvicinare e si fanno toccare. Nel momento dell’incontro dello sguardo con la superficie della tavola dipinta mi rendo conto che c’è un corto circuito temporale: il disegno è perfetto, troppo perfetto per la mano dell’uomo, sembra quasi stampato eppure l’olio, la materia della pittura rinascimentale, mi rimanda al corpo, un corpo che è rimasto segnato dall’incontro con la macchina: bruciato. La bruciatura è vivida sulla tavola ma è già successo. Mi ritrovo ad essere testimone di un passaggio che è già avvenuto ma davanti ai miei occhi è nel suo compiersi: dal corpo alla macchina.Di chi è il mondo che si apre nelle tavole di Mendeni? Della macchina o del corpo segnato? “reale è virtuale”. Quest’affermazione ha come obiettivo riaprire i giochi sulle nostre più sedimentate abitudini di raziocinio, favorendo il superamento del “pensiero comune” con l’obiettivo di un avvicinamento al “pensiero filosofico”. La filosofia può considerarsi, ancora oggi, un assiduo attacco nei confronti del buon senso. Attacco, questo, che non ha lo scopo di eliminare il pensiero quotidiano, standard, sostituendolo con quello filosofico, bensì si propone come agitatore, nel rendere l’attività speculativa costantemente inquieta, in modo che si confonda, perdendo la sua presunta sovranità su ogni sapere e riflessione. Uno dei principali strumenti argomentativi del pensiero filosofico è la dialettica, che ci ricorda l’impossibilità della comprensione senza passare attraverso l’altro, l’opposto. Ritornando alla nostra affermazione iniziale, alla luce del supposto obiettivo, il reale assume di essere ciò che vi è di essente nel virtuale, mentre il virtuale si fa carico solo di quello che non è essente. Il reale <<è>> assume, quindi, su di sé la possibilità del virtuale e di una sua eventuale modificazione. L’identità richiede essere intesa in un senso superiore, accresciuto; necessita di vedere superata l’idea di stessità (un rafforzato essere) come semplice medesimezza (come di persona o cosa che risulti essere una sola), realizzando la co-appartenenza del diverso nell’uno, il quale è anche il fondamento della possibilità del diverso. In questo modo, il reale <<è>> un’unità immediatamente produttiva, rivolta in maniera progressiva ad altro, creativa. Il virtuale è la possibilità, per il reale, di un cambiamento, di un nuovo pensiero. La collettiva “reale è virtuale”, sarà presentata per la prima volta in occasione della fiera SetUp 2017 di Bologna, realizzando l’inizio ufficiale dell’attività di .spaghettiparty.it. In relazione all’ambiente e allo spazio espositivo, possiamo considerarla l’introduzione effettiva ed effettuale di una mostra nomade destinata a evolversi e che vedrà altre location durante l’anno 2017. Gli artisti, Alterazioni Video, Marco Cadioli, Ilario Caliendo, Lorenzo Commisso, Marco Mendeni, Giovanni Fredi, Elisa Giardina Papa, Guido Segni presenteranno un lavoro/progetto, inedito o prodotto nel 2016, dando luogo, con la loro produzione di immagini, a un equilibrio dinamico tra pensiero comune e pensiero dialettico, in grado di accettare l’affermazione “reale è virtuale” e quello che ne deriva nella lettura e comprensione della verità contemporanea. Spazio Contemporanea Brescia, Curated by Fabio Paris. Every step of REFRESH presents new projects and researches by artists from different generations, who started working from the Mid Nineties onward. All the exhibitions will be accompanied by a bilingual (Italian / English) publication. Curated by Fabio Paris, REFRESH 01 – #LAYERS is the first event of the series. The show will open at Spazio Contemporanea, Brescia on October 22, 2016, with a selection of 12 artists presented under the hashtag #LAYERS. Broad and comprehensive as it seems, this keyword refers to the various ways in which the complexity of the digital environment manifests itself in the works on show: the distinction between code and interface in generative art and glitch art; the layers in a digital image; the strata of time in the archives of digital memory; the distinction between public and private, material and immaterial, visible and invisible. At the end of the event, a small publication in Italian and English featuring documentation of the show will be published by Link Editions. “Vertigo is a defensive reaction of the body that warns of a lack of orientation and points of reference: it no longer finds its place in the World. It is a feeling of dizziness, a blurring of the brain, where everything moves until balance is lost. A crisis of identity, no longer adhering to imposed generic standards, a sense of helplessness from physical and mental inertia, and panic of failing: something like what Lovink calls the Psychopathology of information overload. In his works Diego Zuelli reveals the balancing act between reality and its computer reconstruction, choosing conversion and transcendence. With an unnatural attention to detail and an intimate, sometimes dreamlike or movielike, approach, he invites us to question the Society of the Spectacle. Immersive spaces, 3D digital sculptures created in the image and likeness of mathematical and scientific models are showned in ‘Particle Man’ by Glenn Marshall. A manic 2.0 craftsmanship, made of studies in Newtonian physics to investigate forces, accelerations and the mass of individual particles of matter – narrated and created via software. As well, programming videogame environments, Marco Mendeni constant searches for the mimesis, never ceasing to amaze us with similarity and fruition which is increasingly detailed every time. Boris Labbé was given the mission to undermine the ordinary alphabet of cinematographic representation, making us sink into cyclic worlds of palingenesis, where loops also mean regeneration – from the infinitely small to the infinitely big – and a perpetual return to life. Daniel Schwarz’s video seems to be a potential space, where he builds ephemeral architecture and free space-districts; scaffolding assets that stand out in cosmic darkness. 6PMYLT is a format conceived by the Link Art Center and developed in collaboration with Abandon Normal Devices (AND) and Gummy Industries. “r_lightTweakSunlight” is the simulation of a fictional world and a suggestive places exploratory documentation inside the machinery, a trip through its contingencies and its dark sides. A path through seemingly real worlds which fragment themselves in the vision, losing volumes, shapes. He deconstructs and disintegrates the matter, aimed to a gradual change of. MOD di videogame giocati online come “Day Z”. I lavori uniscono la componente digitale a quella materica in un unicum percettivo, mettendo così in relazione la parte immateriale del gameing con la degradabilità organica dei supporti su cui sono realizzate le opere. Concludono l’esposizione alcuni lavori realizzati in cemento, sia del primo ciclo “SimCity” e “GameOver“, sia opere di nuova produzione come la serie “Google”. Qui l’aspetto materico enfatizza ulteriormente la caducità della società contemporanea digitale comunemente considerata come infinitamente trasmissibile e impalpabile. L’esposizione organizzata da Theca Gallery è concepita come esperienza di totale immersione che il visitatore vive all’interno dell’ installazione trasmediale creata dall’artista. La mostra rimarrà aperta fino al 13 giugno. Un percorso fra paesaggi apparentemente reali che si frammentano nella visione: questo Ë il mondo creato da Marco Mendeni, direttamente da call4roBOt. Come un architetto decostruttivista che rompe i sistemi figurativi per ampliare il concetto di forma, líartista, attraverso software avanzati per la creazione di videogiochi, destabilizza lo spettatore suggerendo una verit‡ possibile. Una nuova mostra “WHY NOT?” a Palazzo Bocconi sede del prestigioso Gruppo Finanziario Azimut Consulenza Sim SPA di Milano denota tutto il suo carattere già a partire dal titolo: “Perché No?”. Vuole essere una provocazione che con disinvoltura ha saputo unire artisti molto interessanti del panorama artistico non solo italiano ma anche internazionale. Sono sette artisti sapientemente e attentamente selezionati da THECA GALLERY e dall’Associazione Culturale ART7ARTS. “WHY NOT?” sarà un percorso che nasce qui in Palazzo Bocconi e ha l’ambizione di diventare un leitmotiv a spasso per l’Italia con la volontà di dare luce e spazio agli artisti emergenti oggi che lavorano con uno spirito nuovo giungendo a risultati la cui iconografia, per aspetti tecnici e formali, non ha legami con il passato se non sul piano concettuale da cui spesso attinge. E’ la ricerca costante il seme di questa innovazione di linguaggio, lo vediamo in MARC VINCENT KALINKA con le sue gigantografie le cui immagini sono ricavate riproponendo sulla tela l’intero testo di un opera letteraria russa amata dall’artista, ma anche nelle opere vibranti e modernissime di MARCO MENDENI in cui l’incorporeità dei video games si struttura attraverso il supporto pittorico. E poi c’è EDY GREE. Edy Gree e’ passione, intensità, gioia e talento puro, le sue sculture monocromatiche e le sfere di cemento e acciaio instaurano un linguaggio e uno spazio inviolato con l’osservatore. Le opere di GIANPIERO GASPARINI presenti alla mostra sono un ponte tra il rinascimento e le più moderne nonché originali tecniche pittoriche. Una pittura quella di Gasparini che prende corpo per sottrazione di colore. Le bellissime immagini di evasione di VANNI CUOGHI sono l’ espressione di un linguaggio alchemico fatto di sottili velature, di una ricerca fuori dal comune: la cromaticità attenta e graduata, la finezza della pennellata ci riconduce ai grandi maestri del ‘500 che attraverso la grisaille ottenevano straordinari effetti chiaroscurali. Un apparente contrasto sembra esserci lungo il percorso espositivo quando ci imbattiamo nei monoliti di BARBARA COLOMBO; nessun contrasto, nessuna lontananza, le opere di Barbara Colombo sono il frutto della ricerca portata alle estreme conseguenze: le polveri di metallo e colore che diventano materia. Lungo il percorso veniamo poi catturati dalla densità di linguaggio di ELEONORA POZZI, una vera “forza interiore” così come e’ intitolata una delle opere esposte. Il segno fluido e la tensione della materia giocano un contrasto formale che si traduce in emozione. Questo suggestivo percorso e’ concluso con le straordinarie opere di NICOLA EVANGELISTI le cui ricerche sulla Relatività e sulla Fisica Quantistica hanno condotto ad elaborazioni formali che si basano sulla relazione intrinseca tra spazio e luce in una dimensione cosmologica. Le sue installazioni sono fenomeni ottici che diventano spazio nello spazio. “WHY NOT?” vuole essere un momento per entrare in contatto con mondi e soglie di percezione non ancora conosciuti, l’osservatore si troverà coinvolto a sua insaputa in questa sottile provocazione che profuma di cultura ed evento. + Azimut Gruppo Finanziario è la più grande realtà finanziaria indipendente nel mercato italiano, quotata alla Borsa di Milano. Fin dalla nascita, ci occupiamo solo di ciò che sappiamo fare bene. Noi di Azimut lavoriamo da sempre per costruire valore e fornire soddisfazione ai clienti, offrendo soluzioni di investimento focalizzate esclusivamente sui settori in cui abbiamo saputo sviluppare e raggiungere eccellenti livelli di know-how ed esperienza. + Theca Gallery Lugano è una galleria di arte contemporanea che attraverso le sue mostre e pubblicazioni indaga il concetto di “stratificazione”. Tra gli artisti internazionali rappresentati: Fabrizio Parachini, Jonathan Guaitamacchi, Mohsen Taasha Wahidi, Ohya Masaaki, Marco Mendeni, Carlo Buzzi, Claudia Scarsella, Debora Barnaba, Marc Vincent Kalinka, Federico de Leonardis, Orna Zahra Kazemi e Aja Von Loeper.